AuCom helped progress the emergency water supply for Turkey’s capital city, Ankara by providing a soft starter solution in less than a third the normal manufacturing time. AuCom supplied 60 medium voltage soft starters to ensure a secure and reliable pumping solution to each of the five pump stations along the 130 kilometre pipeline. Ankara experienced low snowfall and precipitation during early 2007 coupled with very hot temperatures that depleted water supplies. Ankara’s water system, severely stressed by this drought, was running very low despite many restrictions in place on watering and water use. The drought placed pressure on the city with many hospitals forced to cancel non-emergency surgery. Restaurants were serving meals on paper plates and offering plastic utensils to reduce dish washing. The Mayor asked residents to go on vacation to reduce water use in the city. The city’s administration worked hard to prevent a water crisis, and the major initiative involved the creation of infrastructure to support an emergency water supply from the River Kizilirmak to Ankara’s five million residents. 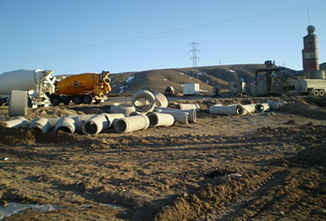 AuCom worked closely with Ankara Water Works (ASKI) and the contractor Ankara Beton to provide a soft starter solution, mindful of the tight deadlines. AuCom’s flexibility and responsiveness was a major component in the supply of soft starters for the project. Additional assistance was provided by the local distributor of AuCom products in Turkey, “We have had a long association with AuCom,” said Sinan Ketencioglu of Koneksis Elektronik Kontrol, “a superior product and our experience in soft starters provides the customer with a total solution.” AuCom’s Medium Voltage soft starters have been installed worldwide in a variety of configurations to suit the customer, with many projects in the Middle East. The Ankara Emergency Water Supply project connects the River Kizilirmak to the Ankara city water supply. 750 kLt of water per day are pumped through three 130 km pipelines. 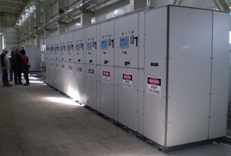 Each of the five pump stations has two motor control centres managed by AuCom MVS medium voltage soft starters. AuCom supplied sixty 6.3 kV MVS units, ranging from 1.2 MW to 2.0 MW, providing soft start to the pumping stations. There are 60 soft starter panels, 60 power factor correction panels and 10 transition panels for termination of feed cables and power distribution.